How does one communicate what it is like to slowly and steadily return to the daily rhythms of life after coming perilously close to leaving this world? I don't really know, but I am going to give it my best shot. This will surely differ from the accounts of other people who have had such experiences and I cannot compare my experience to theirs; I will make no value judgements on the experience of others and if you have graciously been given a second chance at life, I would also ask that you make no judgement on this description of my journey. How could our experiences ever be the same? The culmination of our life's paths results in a uniquely individual tapestry that could never be the same. One may notice colors or patterns that are similar, but they will never be identical. 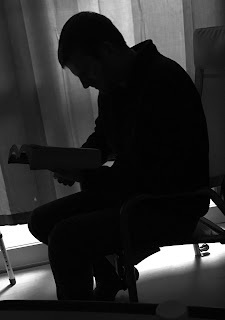 In the video below and to the right, my son Scott, is playing a song that he created while I was a patient at Oregon Health Sciences University in mid-December recovering from a burst aneurysm in the right hemisphere of my brain. It reflects his feelings on what is was like to see his father returning from the fog of a brain injury. I thought it appropriate to include it here. Returning. That's exactly what it feels like is happening and has happened over the last eight weeks. Many things are new again, and I am thankful for a more grateful perspective. Several people have said that I am more calm. One told me yesterday, "You're just so chill." I took that as a compliment! Whether it is a result of the brain injury, or intentional action on my part (I hope so! ), I am grateful for peace! A friend recently told me that I look younger after having come through this experience. That was unexpected, since my remaining hair has turned white in the last eight weeks! For whatever positive that has happened in my persona, I am grateful. I am grateful for time with family. Seeing my kids and being with my wife has all taken on new meaning for me. What amazing people they all are! I am only now realizing what a stressful experience this has been for them. While I have been focused on healing, they have needed to process and decompress from the stress of it all. I am so grateful for each of them. Scotty (second son) gladly took the night shift, while I ordered him around in my jumbled brain state for a few nights. What a trooper! I know I was unreasonable at times, but he was always so patient. Jonathan, in his "fixer" kind of way, was always working on logistics and figuring out how to help me and to assist and support his mother. Annie, as always, brought a welcome bit of comic relief and kept people smiling! Jeremy (in Korea) and Hannah (in Ukraine) regularly checked in and expressed their love and support. I am so thankful for these people. Returning to normal routines after receiving a second chance brings a renewed appreciation for the little things in life. Going to bed in a warm bed is a simple pleasure I more deeply appreciate these days! I realize my brain needs adequate space to heal, and sleep is a critical part of that, but following little, simple sleep routines is a wonderful pleasure! Warming my shoulder and neck wrap in the microwave, putting on a little chapstick, and my menthol oil from China are all simple actions that bring pleasure and I am grateful to be able to nod off to quiet music after having completed these simple routines. Going to bed. I am thankful. Going for a walk in the snow with my wife of 37 years has been a joyful and sweet experience I will always treasure! 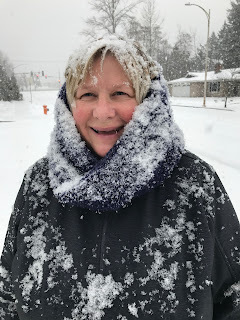 We've had an unusual amount of snow and cold weather this winter, and shortly after I returned home, we were able to venture out for some pleasant walks. Being with my students and my co-workers is a daily luxury! There are so many kind and wonderful people around us who care so deeply. From Jennifer's laugh echoing down the hallway, to Jack telling me he noticed the sunrise today...what joy there is in being a part of the lives around us. I am so thankful for the people who share our days. The first time Jeannie and I went outside for a walk, we only went up and down the sidewalk in front of our house a time or two, and I was like a hunched over old man, unsure of his steps. It was exhilarating and discouraging at the same time. I wondered if it would always be like that. Now, I am back to a normal exercise routine up and down the hills in our neighborhood, at a normal pace, and have lost 30 pounds. I am so thankful to God for his mercy. Just going outside in the morning to get some exercise is so exciting! When you've been through something like this, every time you are again able to see or do something you love brings such deep joy. I will always be so thankful for God's unmerited favor that has come my way. I don't know why the Lord has allowed me this second opportunity at life. I do know He is good and kind. I also know that even if i had died on the school bathroom floor that December 7th, or if I had emerged from this experience with cognitive or physical disability, He would still be good and kind. I may never understand why He allowed me this honor. I do know I am making my best attempt to steward this opportunity the best way I know how. So, if I see you in the store or at the coffee shop, don't worry if I wrap my arms around you and shed a tear. I tend to get a little emotional the first time I see people I love. You see, I am returning to normal life and I am really, really happy about it.